Embedded systems often have limited memory, that can be a challenge when your application requires Asian languages where fonts might be several megabytes large. Below we describe a method to reduce the file size with Fontforge using simhei.ttf, a CJK font as an example. Removing Bitmap from Font File. Some TrueType files embed a bitmap version of the font. When Fontforge opens such a file, it will ask whether to keep the bitmap or not. We can remove the bitmap to reduce the file size. Using a glyphs subset adapted to your application. 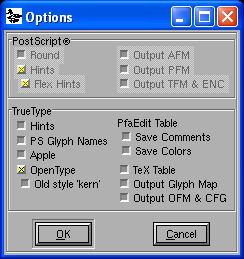 We can use Fontforge with cidmap (Fontforge proprietary) and/or Cmap (from adobe) to perform this task. Please check http://partners.adobe.com/public/developer/font/index.html#ckf for further information on CJK/CID file for your language. Select Delete to remove the extraneous glyphs. Then on the top menu click on CID->Flatten to return to normal font type. Following the three steps above, we reduce the file size of simhei.ttf from 9.57MB to 1.98MB. Further minor size reduction should be possible by using Elements->Font Info. However, some of the options may reduce the font quality. I’ve done this a few years ago, fontforge (and possibly simhei.ttf) may have changed in the meantime. Are you able to do any other steps to reduce the file size? Also, I found that I don’t have Adobe-GB1-4.cidmap, but I do have Adobe-GB1-5.cidmap. I will try to work with that one. Oh, the last step of unchecking “PS Glyph Names” still works. Oh, awesome. I resized a 873 Kb font to 469 Kb. Glad you managed it. It’s quite small, is it a font with simplified Chinese characters ? oh, no. The 873 Kb was another font. Simhei I downloaded is 10 Mb :), and it also got reduced a lot – to 2.1 Mb. Thanks for the article :). Does anyone help to reduce Ubuntu R font size and give me to [email protected]. I’m VietNamese, i can’t install FontForge :(. I don’t understand why you are not able to install Fontforge. Is sourceforge.net blocked in Vietnam? Where was the final generated font file saved?